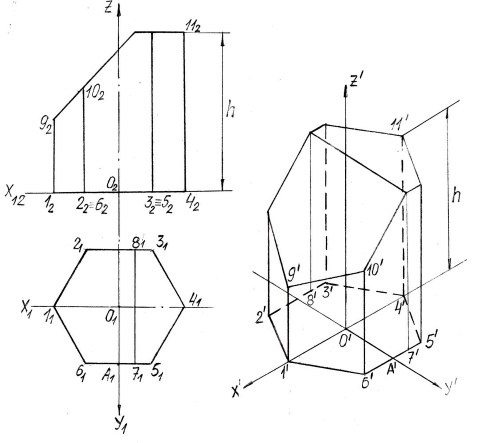 Or axonometric axonometric projection is a parallel projection on one plane of any geometric element coordinate axes associated geometrical element. On a complex drawing (plot) in orthogonal projections displayed position of a point, line, surface with respect to the planes of projection. Distance these geometric elements of the projection planes are the natural coordinates. When designing on a plane axonometric projections N’ natural coordinate system Oxyz will axonometric coordinate system O ' x'y'z’, and the projection of any point of the axonometric projection or axonometric view A’ (figure 1). If you move from plot the horizontal projection of point A₁ of the new system, it will be so-called secondary projection and the point will have the axonometric coordinates. 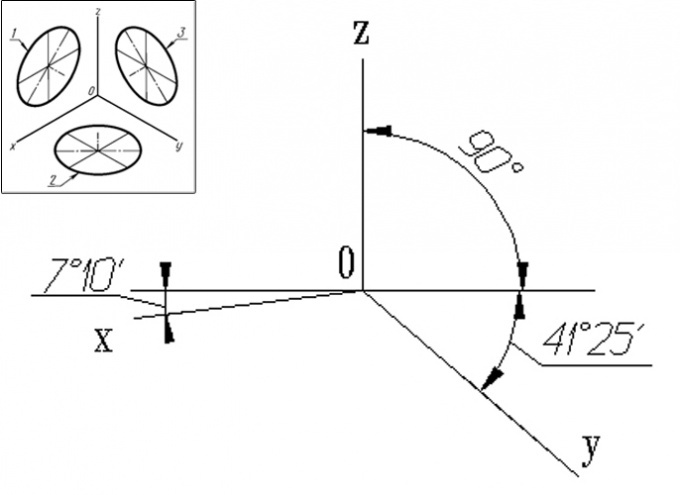 The ratio of the axonometric coordinate is called the natural rates of distortion on the axes. 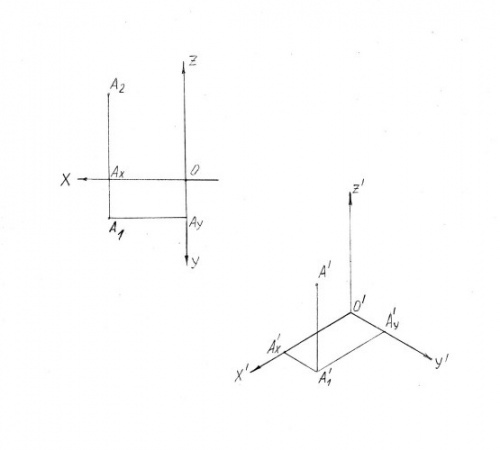 They are designated u, v, w, and the magnitude of the angles between the axonometric axes respectively, α, β, and γ. - isometric – indicators of distortions in all three axes are equal u=v=w. the diameter of the indicators of distortion are equal in two axes u=w≠v. Typically, the metrics of distortion u, v, w have fractional values, but to simplify the build using the given values. 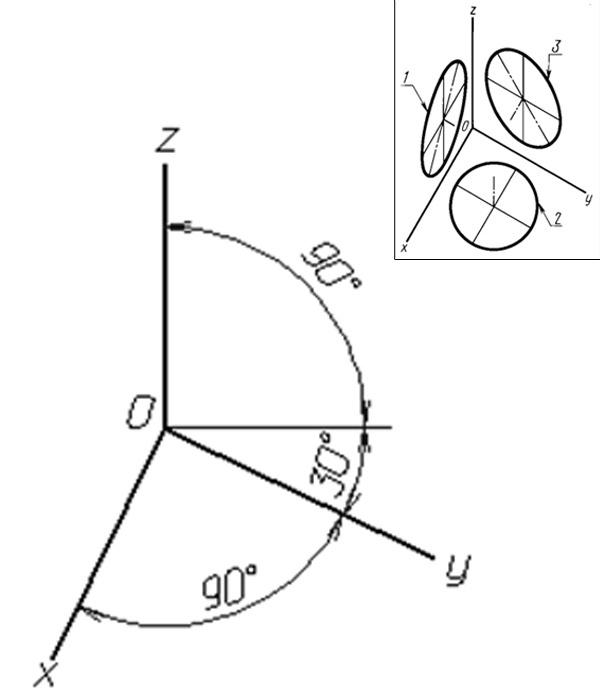 For example, in the isometric view given coordinates equal natural. Example. To build a rectangular isometric projection of the prism (figure 2). 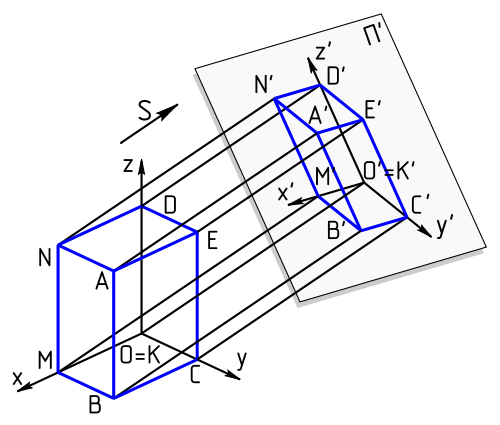 Complex drawing of a prism is specified in the system of axes xyz, the origin point O.
Construct axonometric axis O x'y'z’. The angles between the axes α, β, γ is equal to 120⁰ (figure 3). In the axonometric axes build a secondary projection of the prism. Let the origin point O’ and the axis z’ passes through the major axis of the prism z. All sizes with comprehensive drawing, move on the axis x O y’ unchanged because the coefficients of distortion on the axes equal to 1. From the point O’ put cut and О₁1₁ О₁4₁ axis x’. Mark the points 1’ and O’, and y’ put cut OA. Get the point O’, A’. On the plot cut 6₁5₁ parallel to the axis x₁, hence, the segment 6’5’ guide parallel to the axis x’. Put it distance А₁6₁ and А₁5₁. Mark the resulting point 6’, 5’, and similarly to construct symmetric points on the 2’, 3’. Determine the position of the points 7’ and 8’, putting aside the size 7₁А₁. Thus, in axonometric projection is constructed of a secondary projection of the base of the prism– 1’,2’,...8’. From each point draw straight, parallel to the axis Z’. On these lines set the height of each point with the frontal projection of the prism on the plot. From point 1’ put cut 1₂9₂, and from the points 2’ and 6’ – cut 2₂10₂. From the rest of the points 3’, 4’, etc. set aside marked with the height h. Combining all constructed points will get a perspective of the prism. 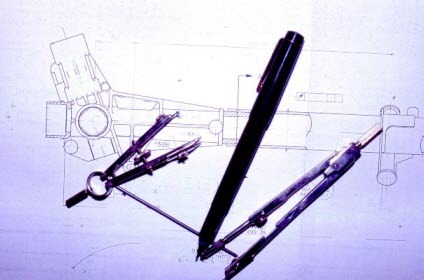 Axonometric projection of parts of machines are often used in the design documentation in order to demonstrate the design features of the part (subassembly), to see how it looks the item (node) in space. Depending on the angle at which are located the axes, axonometric projections are divided into rectangular and oblique-angled. Program for drawing, pencil, paper, eraser, protractor. 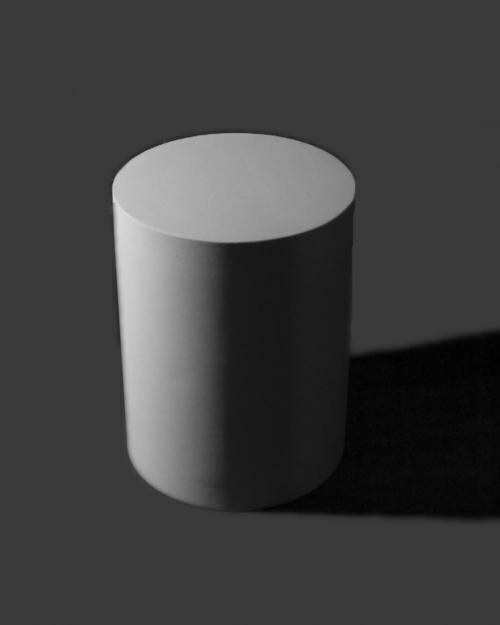 A rectangular projection. Isometric projection. When you build a rectangular isometric projection take into account the distortion ratio in the X, Y, Z, equal to 0.82, while the circumference parallel to the planes of projection are projected on the axonometric plane of projections in the form of ellipses, the major axis of which is equal to d and with a minor axis of 0.58 d, where d is the diameter of the original circle. 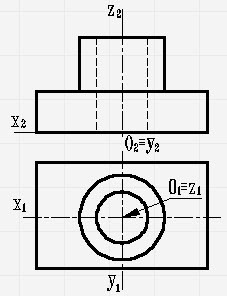 For ease of calculation isometric projection are performed without distortion of the axes (distortion factor equal to 1). In this case, the projected circle will have the form of ellipses with the major axis, equal to 1.22 d, and the minor axis equal to d of 0.71. Dieticheskaya projection. 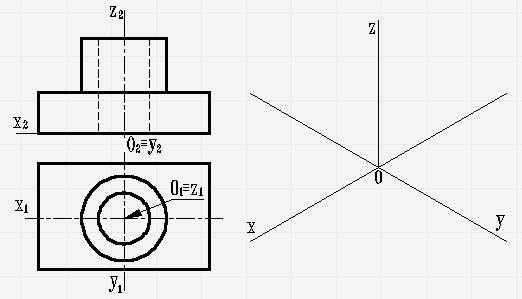 When building rectangular dimetrically projection takes into account the distortion factor along the axes X and Z, equal to 0.94, and the Y – axis is 0.47. In practice dieticheskoe projection simplistically perform without distortion in X and Z and the distortion factor along the Y-axis = 0,5. 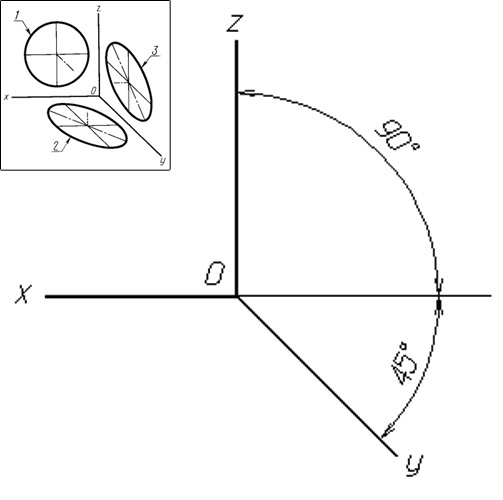 A circle parallel to the frontal plane of projection is projected onto her in the form of an ellipse with the major axis equal to 1.06 d and the minor axis, is equal to 0,95 d, where d is the diameter of the original circle. 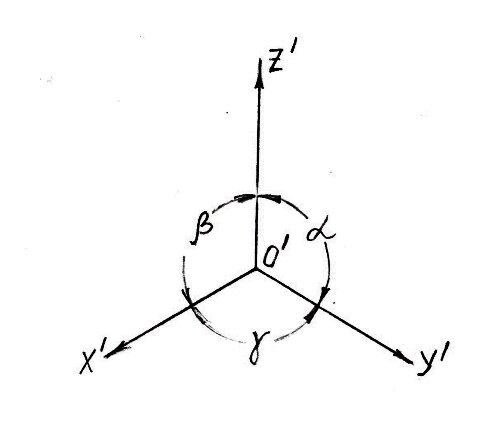 Circle, parallel to the other two axonometric planes are projected onto them in the form of ellipses with the axes, respectively, equal to 1.06 d and 0.35 d.
Oblique projection. Frontal isometric projection. 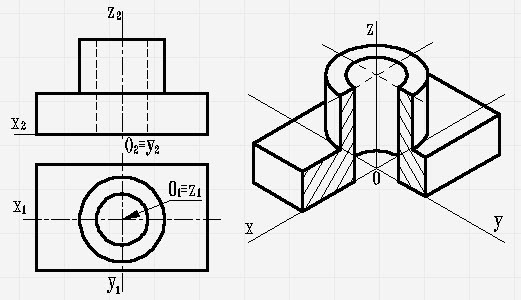 When building a front isometric view standard the optimum angle of the axis Y to the horizontal of 45 degrees. Allowed tilt angles of the Y-axis to the horizontal - 30 degrees and 60 degrees. 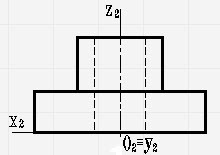 The distortion ratio in the X, Y, and Z equal to 1. Circumference 1, located parallel to the frontal plane of projection is projected onto it without distortion. 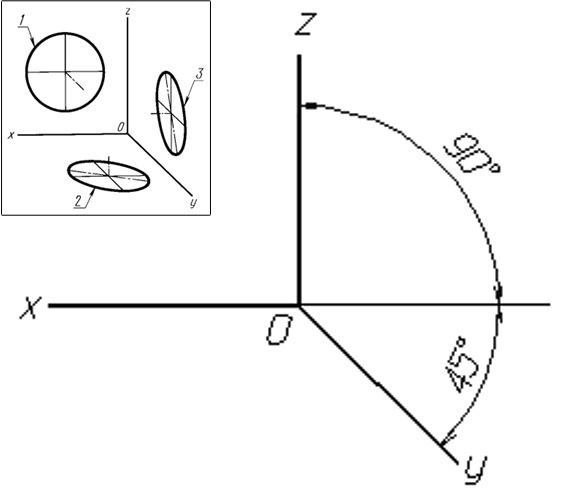 Circles parallel to the horizontal and profile planes of projections, made in the form of ellipses 2 and 3 with the major axis equal to 1.3 d and a minor axis equal to 0,54 d, where d is the diameter of the original circle. 1 ellipse – major axis equal to 1.37 d, the minor axis is 0, 37d; 3 ellipse – major axis equal to 1.22 d, the minor axis – 0.71 d.
the major axis of ellipses 2 and 3 is equal to 1.07 d; minor axis of ellipses 2 and 3 is equal to 0.33 d.
Axonometric projection (from al-Greek. ἄξων axis, and ancient Greek. 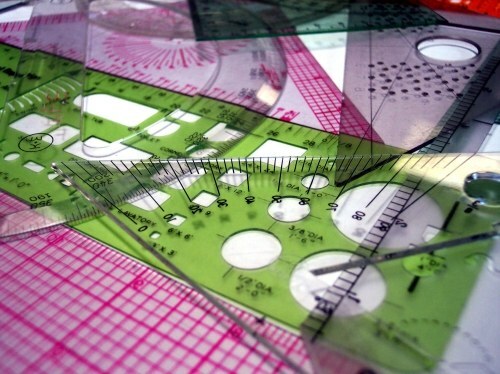 μετρέω "measure") is a method of image геометричеук4уеских items in the drawing using parallel projections. How to portray three-dimensional body on the plane of the paper? For this purpose, methods of perspective (from the Greek words "axis" — axon and "measure" — metreo) or projection. The easiest way to show this principle in the case of Cuba. The axonometric view can be made in a rectangular projection, and oblique. First, build the cube in a rectangular isometric projection, i.e. the projection occurs perpendicular to the plane of projection and the scale on each axis the same. Usually, for simplicity, the distortion factor is accepted equal 1. Draw three axes. To do this with a ruler and pencil draw a vertical line from about the middle of the sheet up. Using the protractor from this line put angle of 120 degrees to both sides and make the appropriate line. Turned axis in space. Now on these axes put the same segments. From the points draw lines parallel to a coordinate axis. For this purpose again it is necessary from each point to postpone for 120 degrees in both directions. And on each beam with a ruler put a cut of the same magnitude as before. Now, connect the resulting points in parallel lines. Get the rectangular cube in isometric projection. It still bears the name orthogonal. To get a rectangular diametrical projection, and save the sizes in any two axes, and the remaining is distorted in a desired or arbitrary degree. In fact, the cube turns into a parallelepiped. In addition there are rectangular oblique projection, in which projection occurs at any angle to the plane in addition to direct. Distinguish frontal isometric projection, front demetrescu and horizontal isometric projection. In order to build a front oblique projection, put the following angles between the axes: horizontal and vertical — 90 degrees, and the third axis tilt relative to the vertical to 135 degrees. In addition, allowed other deviations 120 or 150 degrees. After that, build a projection similar to the previous case, but only in the frontal projection will maintain the aspect ratio. For horizontal projection, the proportion will keep in the horizontal plane. 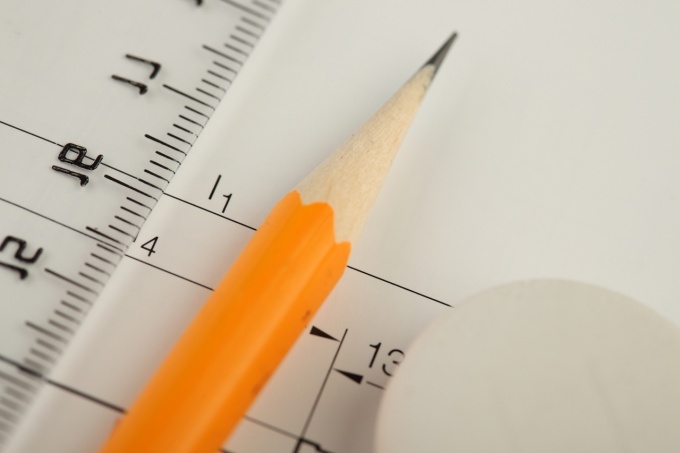 During isometric projections is difficult to assess the depth and height of the graphic. Axonometric view is most often used in an engineering drawing and CAD and in computer games for creating three-dimensional objects and panoramas.